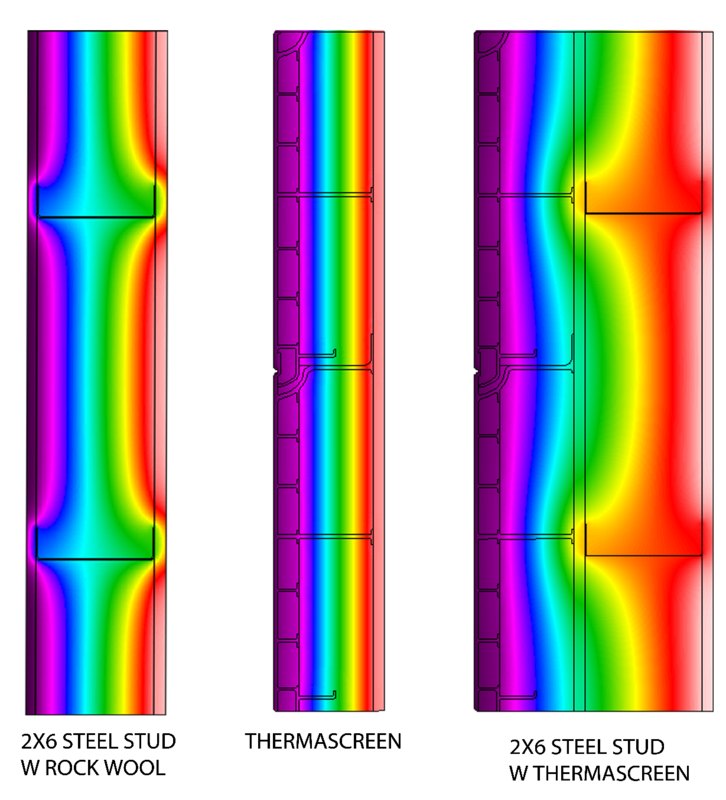 Thermal conductivity is defined as the rate of thermal movement through a material per unit area, per unit thickness, per unit temperature (delta T). BTU is used to describe the heat value (energy content) offuels and the power of heating and cooling systems. BTU is a measurement of the transfer of heat loss or gain, due to the difference between indoor and outdoor air temperature. One BTU is the amount of heat required to raise the temperature of 1 lb (0.454 Kg) of liquid water 1 ̊F (0.556 ̊C). One BTU is approximately the heat produced by burning a single wooden match. A window with a U-value of 0.30 will lose half the energy that a window with a U-value of 0.60. 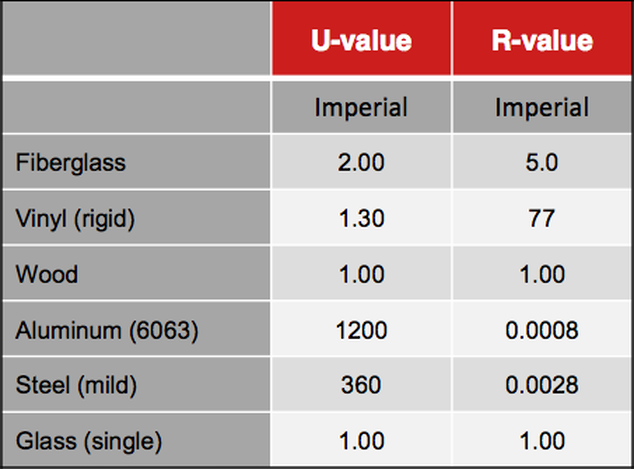 R-value is the resistance to thermal conduction per unit thickness of a material. R-value is the inverse of U-value. The higher the R-value, the more effective or resistant to heat loss the building’s insulation will be. Fiberglass is the most energy efficient cladding system material offering resistance to heat loss, reduced heating and cooling costs, and improved occupant comfort. 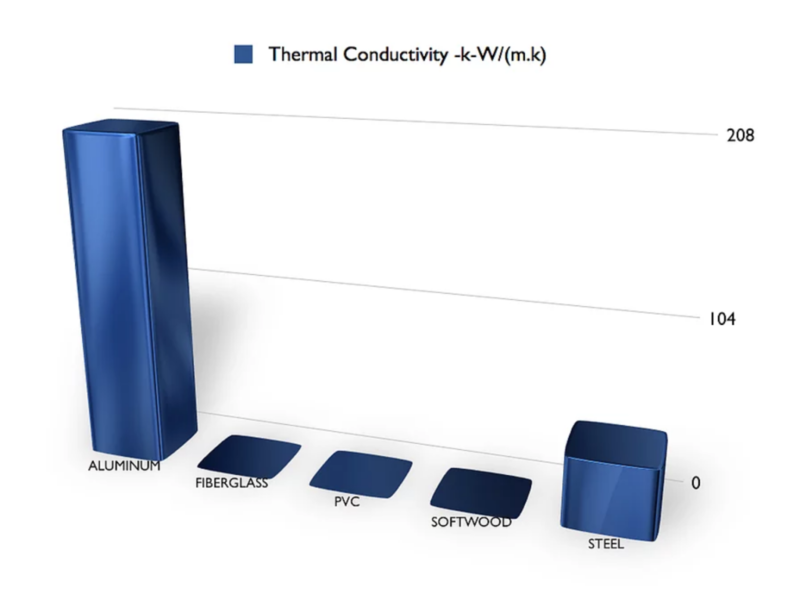 A simple touch test demonstrates fiberglass’s thermal efficiency; in cold climates fiberglass is warm to the touch, in hot climates it’s cool to the touch. What is being felt in a fiberglass cladding is the lack of heat transfer. Fiberglass cladding systems do not need a thermal barrier within the frame, as required by aluminum and steel cladding systems, as the whole fiberglass frame is a thermal barrier. Relative humidity (RH) is the ratio of the amount of water vapor molecules actually present in the air, as a percentage of the maximum moisture the air can hold at a given temperature. The warmer the air temperature the lower the percent RH. When warm moist air meets a cold surface, the air temperature drops, raising the RH, until the RH is 100%, where it meets its dew point. Any moisture in the air over 100% is squeezed out and deposited on the closest coldest surface. The ideal humidity comfort level is a broad range, from 30-50% RH. Below 30%, anyone with asthma or bronchial problems may have difficulty breathing. Building occupants may think they have a perpetual cold, but are suffering from the effects of lowhumidity. Low humidity dries out nasal passages and aggravates mucus glands simulating a cold. Cuts and wounds heal slower in this environment. the reduction in the effectiveness of insulation, deterioration of drywall, and structural deterioration. Vinyl is seven times greater than fiberglass. Aluminum is three times greater than fiberglass. Wood does not expand and contract due to temperature change, but is subject to swelling and shrinkage due to moisture absorption.